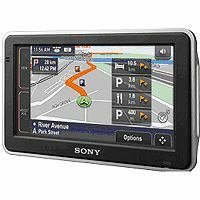 Widescreen, 3D Maps, Can The Sony Take On TomTom and Garmin? Right, lets start. Sony are looking to grab a piece of the very lucrative in car Satellite Navigation market, so today we're looking at the NV-U82, a great looking wide screen unit that has the specification to compete, but is it as usable as a Garmin, TomTom or Navman? What do you get for your 200 notes? Pre-loaded maps of the UK and Ireland, (and Northern France), a Speed-Camera database, thousands of POI's (petrol stations, hotels, etc. ), 4.8" touch widescreen, 512mb of memory, high-sensitivy GPS receiver, full Post-code search, 3d maps, voice instruction and automatic re-routing. An innovative windscreen / dashboard mount is also included that is quite unusual, but could work well. So let's get it out of the box and turn it on. The NV-U82 takes a while to boot-up first time as it loads the maps, then we're into the navigation system. The menu's are logical enough for those used to using Sat Nav's, and everything flows nicely with menus sliding in and out, looking very flash. It is however on the slow side. Maybe we're spoiled with the user-interfaces on the likes of the Garmin Nuvi 200 or the New TomTom Go Range, but the Sony does feel a little old hat. It all harks back to some of the older Medion or Mio units of a couple of years ago. Don't get me wrong, once you've used the unit a few times everything does start to make sense, but I'm used to Sat Nav's that you can take out of the box and start playing with almost intuitively, and the Sony takes a little more work. Once mounted on the windscreen, using the unusual gel-pad type sucker, the widescreen s quite impressive. The test / review unit picked up a GPS signal quickly, and had no problem with any of the addresses I entered. I didn't have time to check out the speed-camera warnings, but for normal navigation the voice was load and clear, and the screen looked very good. Apparently it has a sensor to adjust the brightness of the display depending on ambient lighting conditions, but as I was driving during the day I didn't notice it. Sony make a fanfare about their "position plus" guidance software and auto re-routing, but it all seemed to work in a similar vein to previous Sat Navs I have tested, but apparently the unit is very good at estimating your course and speed when you enter GPS black-spots such as tunnels, but as there aren't any near where I live I'll just have to take Sony's word on that. So should you buy one? We've really got to compare it to similarly priced models from Garmin and TomTom, the One XL or 200w, which are in the same price bracket of just under £200. Although the Sony looks flasher I have to say that I would lean towards the widescreen Nuvi 200w, or the One XL. They are just easier to use and I feel more at home with them. Plus I have the confidence that Tom Tom and Garmin are in the market for the long term, who knows what Sony might be doing next year. In conclusion try before you buy, a good effort, but Sony must do better if they want to compete with the big boys such as Garmin, TomTom or Navman. My sony nv-u82 always lost the satelite signal ! why this happens ? is dificuld to find a signal even in open areas ! Hi. Having a major problem with my NV U82. Seems when entering an address I need to know every line of the address. It will not allow me to skip an address line or search all. Thinking of chucking it. Any solution to this? Thanks Eugene. Check your manual to see if you can do a reset. My Sony NV-U82 does not show me speed camara sites can you explain how i can activate this in easy to understand ways. David. I have heard that you need to pay to update the maps on your sat-nav. Is this the case with the Sony U82. My partner had one which he found useless because of the cost of updating. Look forward to hearing from you. Margaret. You always have to pay for major map updates. I would steer clear of the Sony if thats a problem and get a TomTom, where you get free minor updates for a year after buying it.